For other roads designated "A10", see A10 road. "Cambridge Road" redirects here. For other roads with the same name, see Cambridge Road (disambiguation). 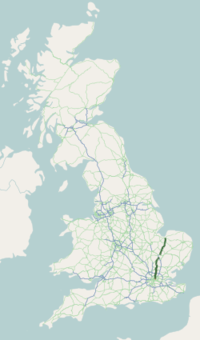 The A10 (in certain sections known as Great Cambridge Road or Old North Road) is a major road in England. Its southern end is at London Bridge in the London Borough of Southwark, and its northern end is the Norfolk port town of King's Lynn. From London to Royston it chiefly follows the line of Roman Ermine Street. Within the City of London, the route of the A10 comprises King William Street, Gracechurch Street, Bishopsgate and Norton Folgate. It then becomes Shoreditch High Street, Kingsland Road, Kingsland High Street and Stoke Newington Road. It runs through Stoke Newington as Stoke Newington High Street and then becomes Stamford Hill, through Stamford Hill until Tottenham. In July 2013, the Tottenham Hale gyratory was removed and the A10 now follows the route of Tottenham High Road in both directions. North of Tottenham, the A10 leaves its historical route of Tottenham High Road/Hertford Road (now A1010) to join the Great Cambridge Road via Bruce Grove and The Roundway. The Roundway is the southern end of a long dual carriageway section of the A10, which extends to just south of Buntingford. This dual carriageway section bisects the London Borough of Enfield, skirting the Enfield fringes of Enfield Town before crossing the M25 motorway at junction 25, near Waltham Cross. Until the late 1970s, the Great Cambridge Road passed through the towns of Broxbourne, Hoddesdon and Ware – along what is now the A1170 road. Since then, an all-purpose road from Cheshunt by-passes these towns. The Kingsmead Viaduct takes the A10 high over the Lea Valley between Hertford and Ware and the Hertford East Branch Line railway. North of Ware, a further by-pass scheme was opened in late 2004, taking the A10 around the Hertfordshire villages of Wadesmill, Thundridge, High Cross, and Collier's End. The bypass would have opened sooner, but the lime-stabilised subsoil heaved and cracks opened up in the road surface. A substantial portion of the road surface had to be relaid. Further north, there is another section of 1970s dual carriageway road between Puckeridge and Buntingford, the contract for which was awarded to Meres Construction Ltd in April 1972. Buntingford was by-passed in the 1980s, however this is only single carriageway. From Buntingford, the road runs through the villages of Chipping, Buckland, and Reed, before reaching the edge of Hertfordshire in the market town of Royston. Once in Cambridgeshire, the topography changes from undulating hills to flat agricultural and fenlands, round the villages of Melbourn and Foxton (the road going over a level crossing adjacent to Foxton railway station), through Harston and up to the M11 motorway at junction 11, near Cambridge. A10 traffic is signposted to travel north on the M11, skirting round the top of Cambridge on the A14; however, the former course of the A10 turns into the A1309 and heads for the city centre. The original A10 went through the heart of the city, past the major colleges along King's Parade, before turning north-east at Midsummer Common. The A10 reappears to the north of Cambridge at the Milton Interchange of the A14 and heads north, bypassing Ely and Downham Market before reaching the coast at King's Lynn in Norfolk. Its northern section runs along the valley of the River Great Ouse (which meets A47 and A149). Where the A10 bisects Cheshunt as an urban dual carriageway, it is prone to traffic congestion, in particular because of the many junctions with local roads. In the early 1990s properties beside the road were compulsorily purchased for a relief scheme that involved sinking the road below ground level through Cheshunt and converting the original alignment to single carriageway for local access. However, in the wake of protests against a similar scheme in Wanstead, this was dropped and the road remains a dual carriageway, with surrounding houses having been sold back to private buyers. ^ "Lime stabilisation review follows A10 sulphate heave damage". New Civil Engineer. Emap. 1 December 2004. Retrieved 23 March 2012. ^ "News: By-pass in Hertfordshire". Autocar. 136 (nbr 3968): 17. 4 May 1972. This page was last edited on 12 January 2019, at 22:00 (UTC).